Cupboard Moth Trap - Gardens Alive! Have you ever opened a box of crackers only to find a mass of fine webs? Chances are you have Indian Meal Moths, or "flour moths," as they're commonly known. Keep your dry goods from being infested. 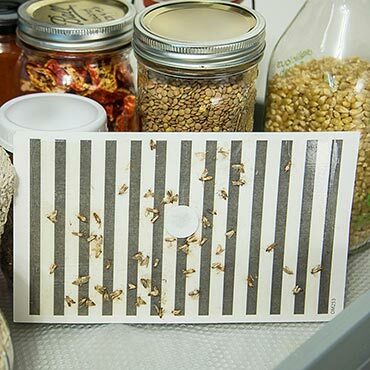 Simply set these non-toxic, pesticide-free traps in your pantry to lure insects away from your food using powerful pheromones--moths can't resist the scent or striped pattern. Dry adhesive glue works great to trap pantry insects but won't stick to your fingers. Bye-bye Indian Meal Moths, Tobacco Moths, Almond Moths and Mediterranean Flour Moths. Lures last 12 weeks.